Building the internet - One site at a time! RookieWeb specializes in website construction for professionals, small businesses, clubs, non-profit organizations and personal websites. A great site doesn't have to cost an arm and a leg! Operating a business, firm or an organization without a telephone is unthinkable, right? It's now the same with an internet web presence. A website is not the luxury it used to be. It's become a necessity. What used to be "what's your address" became "what's your fax number" and now it's "what's your website & email address?" Most people know this. Your competition may already have a website but many think the cost is prohibitive to the small business owners. Not so! Cost is often even more prohibitive for clubs or non-profit organizations. But not anymore! Virtually everyone can have a website of their own now to keep in touch, post schedules and information so people have access 24/7. 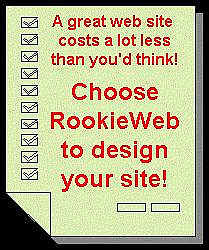 RookieWeb provides quality web consulting services at very affordable rates. Need help in all phases? No problem. We'll walk you through it and tell you up front what's involved. Need to just get it up and going and you'll take it from there? No problem. We'll design and upload and explain what you'll need to do to keep it going! Know what you want to do but not sure what to do? No problem! We'll tailor our services to your needs. The high speed "broadband" services are highly publicized, but the reality is that not everyone has high speed access and this makes a big difference to people accessing your site if you have a slow loading website. We design our sites to be appealing but we design toward simplicity, avoiding the gimmicks that some enjoy. We avoid huge graphics and large script files that will slow down the loading time on the slower connections. This also results in a cost savings on design and uploading too. Some web designers play tricks on you. They'll get your site up and going, but sometimes it turns out it's not really your site at all. They may do things like registering your domain name, but they register it as their property, and then it becomes their property. You either stay with them or have to buy your own site. There's nothing like this when you work with RookieWeb. We have you register your own domain name (if you choose to have a special one) and all the property is yours when completed! We look out for your interests and concentrate on making your website work for you. You will own the name and you will own the content. That's the way it should be. Contact RookieWeb to obtain an estimate on your needs and see how easily you can get your business or organization onto the internet!